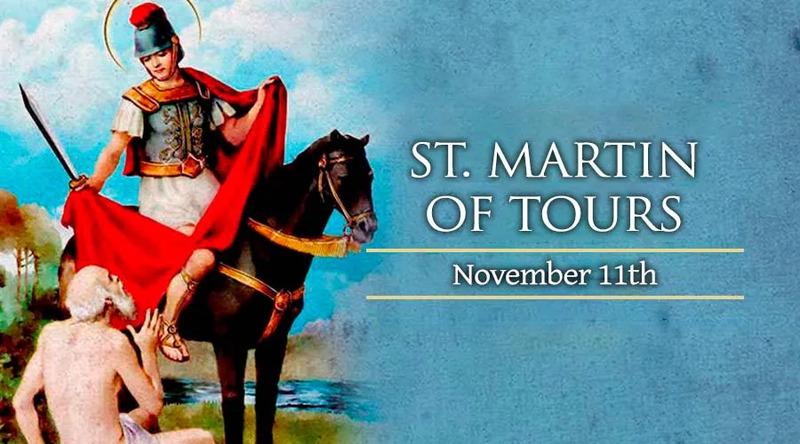 On Nov. 11, the Catholic Church honors St. Martin of Tours, who left his post in the Roman army to become a “soldier of Christ” as a monk and later bishop. Martin was born around the year 316 in modern-day Hungary. His family left that region for Italy when his father, a military official of the Roman Empire, had to transfer there. Martin's parents were pagans, but he felt an attraction to the Catholic faith which had become legal throughout the empire in 313. He received religious instruction at age 10, and even considered becoming a hermit in the desert. Circumstances, however, forced him to join the Roman army at age 15, when he had not even received baptism. Martin strove to live a humble and upright life in the military, giving away much of his pay to the poor. His generosity led to a life-changing incident, when he encountered a man freezing without warm clothing near a gate at the city of Amiens in Gaul. Martin knew that the time for him to join the Church had arrived. He remained in the army for two years after his baptism, but desired to give his life to God more fully that the profession would allow. But when he finally asked for permission to leave the Roman army, during an invasion by the Germans, Martin was accused of cowardice. He responded by offering to stand before the enemy forces unarmed. “In the name of the Lord Jesus, and protected not by a helmet and buckler, but by the sign of the cross, I will thrust myself into the thickest squadrons of the enemy without fear.” But this display of faith became unnecessary when the Germans sought peace instead, and Martin received his discharge. After living as a Catholic for some time, Martin traveled to meet Bishop Hilary of Poitiers, a skilled theologian and later canonized saint. Martin's dedication to the faith impressed the bishop, who asked the former soldier to return to his diocese after he had undertaken a journey back to Hungary to visit his parents. While there, Martin persuaded his mother, though not his father, to join the Church. In the meantime, however, Hilary had provoked the anger of the Arians, a group that denied Jesus was God. This resulted in the bishop's banishment, so that Martin could not return to his diocese as intended. Instead Martin spent some time living a life of severe asceticism, which almost resulted in his death. The two met up again in 360, when Hilary's banishment from Poitiers ended. After their reunion Hilary granted Martin a piece of land to build what may have been the first monastery in the region of Gaul. During the resulting decade as a monk, Martin became renowned for raising two people from the dead through his prayers. This evidence of his holiness led to his appointment as the third Bishop of Tours in the middle of present-day France. Martin had not wanted to become a bishop, and had actually been tricked into leaving his monastery in the first place by those who wanted him the lead the local church. Once appointed, he continued to live as a monk, dressing plainly and owning no personal possessions. In this same spirit of sacrifice, he traveled throughout his diocese, from which he is said to have driven out pagan practices. Both the Church and the Roman Empire passed through a time of upheaval during Martin's time as bishop. Priscillianism, a heresy involving salvation through a system of secret knowledge, caused such serious problems in Spain and Gaul that civil authorities sentenced the heretics to death. But Martin, along with the Pope and St. Ambrose of Milan, opposed this death sentence for the Priscillianists. Even in old age, Martin continued to live an austere life focused on the care of souls. His disciple and biographer, St. Sulpicius Severus, noted that the bishop helped all people with their moral, intellectual and spiritual problems. He also helped many laypersons discover their calling to the consecrated life of poverty, chastity and obedience. Martin foresaw his own death and told his disciples of it. But when his last illness came upon him during a pastoral journey, the bishop felt uncertain about leaving his people. “Lord, if I am still necessary to thy people, I refuse no labour. Thy holy will be done,” he prayed. He developed a fever, but did not sleep, passing his last several nights in the presence of God in prayer. “Allow me, my brethren, to look rather towards heaven than upon the earth, that my soul may be directed to take its flight to the Lord to whom it is going,” he told his followers, shortly before he died in November of 397.